The flowerbeds are arranged by season of flowering and all peak at different times throughout the year. The early spring bed, is in flower from January with snowdrops, aconites and hellebores. There are winter flowering shrubs, including wintersweet (Chimonanthus praecox) and Daphne mezereum. Over this bed stands the impressive tulip tree (Liiriodendron tulipafera), brought to the UK in the 17th Century. This tree is about 120 years old and blossoms in May with yellow/ green tulip like flowers. 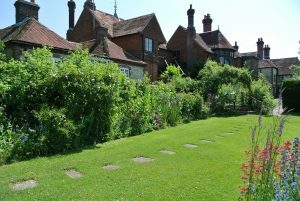 The late spring bed has the silver leaved shrub Artemisia as well as sweet rocket, oriental poppies, vipers bugloss and the sweet pea ‘Painted Lady’ – a species that Gilbert White grew. Growing up two of the ‘wigwams’ is the pretty, annual climber, the cup and saucer vine (Cobea scandens). 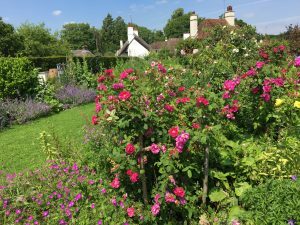 The two summer beds contain different species of old roses, including Rosa gallica officinalis, Rosa moschata, Rosa’Celeste’ and Rosa centifolia all looking their best in June. The roses are planted with lavender, geraniums, dianthus, columbines and foxgloves. The late summer bed has the architecturally striking cardoons (Cyanus cardunculus) as well as the spanish cane (Arundo donax). There are also asters, the perennial sweet pea (Lathyrus latifolius) and french honeysuckle (Hedysarum coronaria). The autumn bed flowers well into October with hibiscus shrubs, asters, coreopsis, rudbeckia and autumn flowering crocus (Colchicum autumnale).